NEW YORK, NY--(Marketwire - January 29, 2010) - In the spirit of the season of love, many consumers are seeking jewelry pieces that convey their heartfelt emotions to their loved ones. Bearing in mind that they will shy away from heart-stopping prices, Overstock Jeweler aims to provide timeless heart jewelry pieces that are equally wallet-friendly. Building their brand with exquisite pieces for their budget-savvy clientele, they will continue that trend with their Valentine's Day jewelry collection. The online jewelry store anticipates that this will spark a new trend in heart shaped jewelry gifts for the season. When faced with how Overstock Jeweler would top their previous season's success, the answer came easily to CEO Elena Castaneda. "Though our Christmas season had recently ended, I knew exactly how I wanted to kick off the New Year -- by highlighting the romance and magic that Valentine's Day brings," she says. What's more, she is confident that their dazzling heart shaped jewelry will capture that level of enchantment. "After all," Castaneda affirms, "we at Overstock Jeweler believe in giving our customers the chance to show their sweethearts what's in their hearts without having to spend a bundle." Overstock Jeweler also recognizes the timeless quality in each heart jewelry piece -- the prime inspiration behind the promotion of the collection during the Valentine's Day shopping spell. 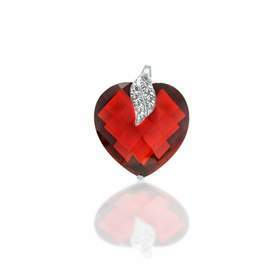 Though heart shaped jewelry is very popular during this time of year, it remains a best-seller beyond the season. As celebrity stylist Amanda Sanders notes, "The greatest thing about heart jewelry is that it is trendy without losing its staying power. Heart shaped gems work as an addition to a classic outfit or a costume piece that will grab a lot of attention." It is that same significance that Overstock Jeweler intends to convey as they encourage consumers to partake in their heart shaped jewelry while keeping their budgets in mind.